Fix WordPress RSS feed not updating problem by following this logical guide. The problem can arise from various points and only a logical checkup will work. Normally all of us uses Google Feedburner Service and some kind of redirection towards the Feedburner’s URL – either via Plugin, Theme or .htaccess rules. The situation is complicated as the error can be from any point – origin, in transit and in delivery. If we try to blindly follow to fix WordPress RSS feed not updating problem, it becomes very complicated trial and error method. WordPress and Windows, as people jokes has kind of series of issues, which are common but none can fix them forever. Both are good guides. But if you follow just our way to find the issue first, it will actually become more easy. Per se, there is no need to re-write same things they have nicely written. In our case, there was no reason; WPBeginner’s way to ping Feedburner worked fine. But, finding the reason is the main point to solve the issue. If you have problem with WordPress feed generation, it is obviously a wastage of time and energy to find how to fix the issue. If you find error in WordPress feed generation, go to WordPress forum and search with something closer to WordPress Feed not updating or like that. There is a plugin, some says it works; some says it never works. Other point is old things – some extra lines or white spaces in some files in wp-includes folder. That means you are a victim of intense headache. You can rename the Plugin folder to deactivate the plugins, change the theme etc. but usually they do not work. The reason is, the left data in wp options in MySQL database, for which we have a video guide on how to clean it up. WordPress will appear a pain to you if these happens. But really these are part of life. This Article Has Been Shared 3552 Times! 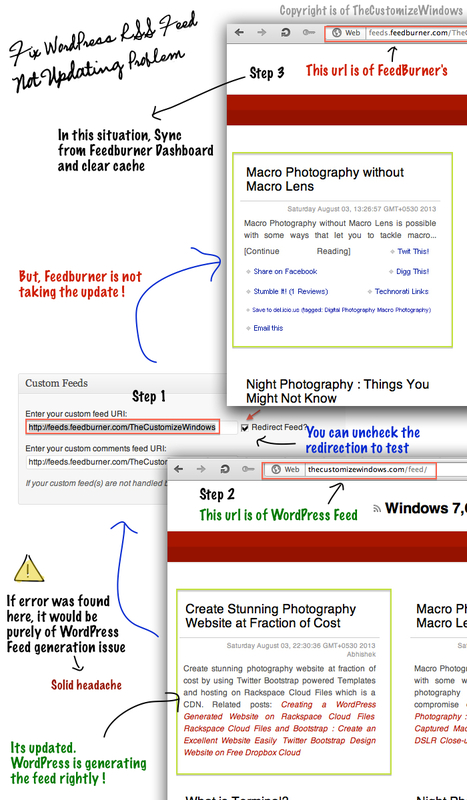 Cite this article as: Abhishek Ghosh, "Fix WordPress RSS Feed Not Updating Problem," in The Customize Windows, August 3, 2013, April 20, 2019, https://thecustomizewindows.com/2013/08/fix-wordpress-rss-feed-not-updating-problem/.